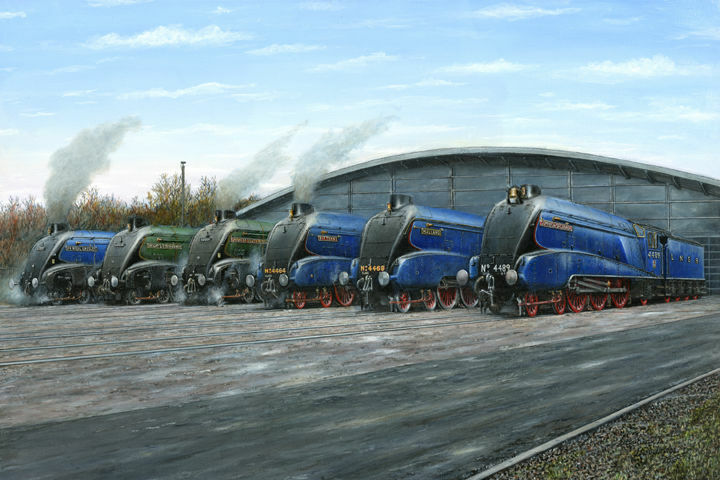 Quick blog this week as I have been away ‘up north’ for the ‘Great Goodbye’ where 6 A4 steam locomotives were brought together for possibly the last time as 2 are going overseas. Very impressive but very popular with over 72,000 visitors during the few days they were there. What also caught my eye last week was the chutzpah of a company selling on eBay. If you do a search for ‘Alan Bott’ in the Art Category with Title and Description ticked you may come up with 84 hits. They are all prints from the book “The Londoner’s England” which must have been taken to pieces. The price range goes up to £16.99 for one page (!!!!) when on AbeBooks you can buy a complete book for under £5, why not buy two as some pages are double sided? While looking through a local paper ‘The Black Country Bugle’ I noticed three articles all mentioning Bantock House. The first was about it being praised by Michael Portillo visiting as part of his railway journeys series, the second was the council wanting to close it down to save money but the third was the one that caught my eye. Unfortunately I was to late to see it but they had run an exhibition called ‘A Tribute to Agatha Christie” and the picture showed some book covers. It was ‘Dumb Witness’ that jumped out and so I’ve made a page to show all the PAN editions that I found I have. I’ve also added an extra Somerset Maugham cover, a 1974 edition of ‘The Moon and Sixpence’ but it seems this is a ‘one off’ as I’ve not found any others with this style of cover. I intended to put this on last month around the time of Someset Maugham’s birthday but Russell Braddon got there first alphabetically speaking as they were both born on the 25th January. Someset Maugham was born in Paris (in the British Embassy so he can be called British) in 1874 and died in Nice on the 16th December 1965. I have put together a page of the titles PAN published over 30 years and I know there are some titles not included. I found a couple published by Penguin but were they also published by PAN at sometime? I’m sure someone will let me know. Incidentally I mentioned the title ‘The Explorer’ in a previous blog and I’m still looking for the edition with the back cover actually printed from the block I have. While looking at Hodder ‘Saint‘ covers as mentioned recently I noticed a couple were signed Gordon King. I thought this name sounded familiar and on further investigation I found a few he painted for PAN. Thanks to the net I managed to get an email address for him and after sending him a few covers he kindly replied confirming or rejecting ones I wasn’t sure about. I have put together a page to show the covers I know of including some from PAN plus other publishers. 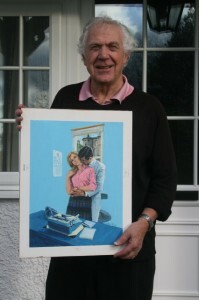 This is Gordon holding a cover for an unknown title, does anyone recognise it? I think it looks a little like some in the ‘PAN Romance’ series (a work in progress) while others Mills and Boon! Gordon has now moved on from book covers to more lucrative commissions.